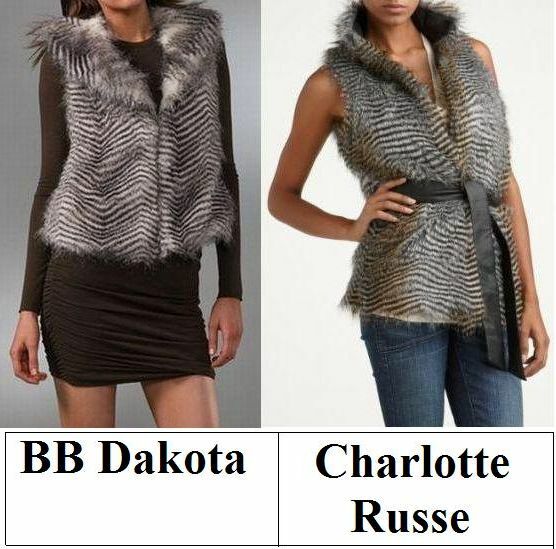 Darlings, to the left take a peek at BB Dakota’s fabulous Janika Striped Faux Fur Vest; to the right prepare to gasp in amazement at Charlotte Russe’s Long Belted Faux Fur Vest. Though the Charlotte Russe beauty proffers a longer hemline than the BB Dakota wonder, and features a removable belt that the higher-priced piece lacks; for just $20.00, as opposed to the $65.00 of the original, it adds the preemptive amount of furry goodness for walking in a winter wonderland to the frugal fashionista’s wardrobe – at a price that is too pretty to pass up! I think I would splurge this time because it's not too much more money, but it's sooo chic!! So cute! Hmm.. since I prefer my vests longer, I'd actually go for the Charlotte Russe one! Also don't love the collar on the BB Dakota one. Great post, E! Can't believe how similar they are with the stripes. Charlotte Russe, I like that it's belted and longer. I adore the Forever 21 one! My favorite is the Charlotte Russe vest. I honestly like the charlotte russe version better! I am kind of craving this vest now!! Just chanced upon your blog and its stunning! :) Love the fur vest! both look gorgeous, great purchase!! I want a fur vest but im not feeling these. I feel like charlotte rousse one added a belt because it probably didnt fit as well. wow, just 20 buck. Amazing! Love the fur! Think I would go for the Charlotte Russe one though. Can I have them both, please? Charlotte Russe never ceases to amaze me, although I'm picking about faux fur--I don't like anything too itchy or cheesy looking, I will definitely check it out. THanks Erika for always making the most amazing finds! Love them both, but I actually love the longer one a little better...so I'm going with the Charlotte Russe! i don't care for either of them to be honest. i can't get away with faux fur anything....it just doesn't fit...me. BUT - the charlotte russe one looks comparable...which is always good!! This is a tough one! I love both of them but I really like the tie on the Charlotte Russe. Gives the vest some form. Hmmm...I like the belt on the Charlotte Russe version. I'm really not a fan of either, but I would choose Charlotte Russe's version if I had to because of the length. Happy Tuesday, E.
They are gorgeous, but I think I would splurge...not a big price difference. You never cease to amaze me! Honestly I like the longer hemline better. One could always add a bit of luxe to the cheaper one with a nicer belt. BTW- thank you for visiting and commenting on my blog post earlier. i had a hiccup with intensedebate on my site and comments left after midnight are gone!! :( So your comment isn't there for me to respond to now - Sorry!! oooohlalalala...OK, great price for the cheaper one, but I might go without the belt. Its very cool..but so needed for warmth. I like the deal you found. Splurge, because he russo vest is nicer:) But I don't like this kind of fur, I want more Rachel Zoe type of vest. Thanks so much for ur sweet commetn btw:) You are so nice, it warms my heart to read ur comments. Ooohhh, I love this! Great find Erika! I love the charlotte russe vest!! the bow tops it all off. Oh, Erika! I love your blog, it's too cute! I want a faux fur vest badly! Such a sweet find at that nifty price. I would save on this one, they both look awesome to me! so into faux fur, i love the belt on the charlotte russe style! I would definitely spend more this time, love the cut much better!! This time I would chose to save. They look so similar to me and its a piece I would probably only wear for the season anyways. Great post! that is such a great deal for an awesome fur vesttt !! it looks just almost the same ! I like the charlotte Russe one. The fact that it's a tad longer and has a belt makes it a lot more stylish. I'd be saving - super cute vest either way! I bet for the right side faux fur vest because it have a good fit and I like the ribbon style which adds a more fab look.